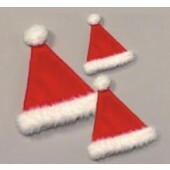 Are you looking for a Santa hat or stocking? Well, Manneco has an excellent assortment of Santa hats from our very cute toddler size up thru our full size and beautiful Velvet Santa Hat with luxurious long-hair plush band and string pom-pom. They are available in several colors including the traditonal red as well as green & white. We have stockings from our mini 6" size all the way up to our giant 60" size. That would most certainly open up the possiblities of a stocking stuffer!! !